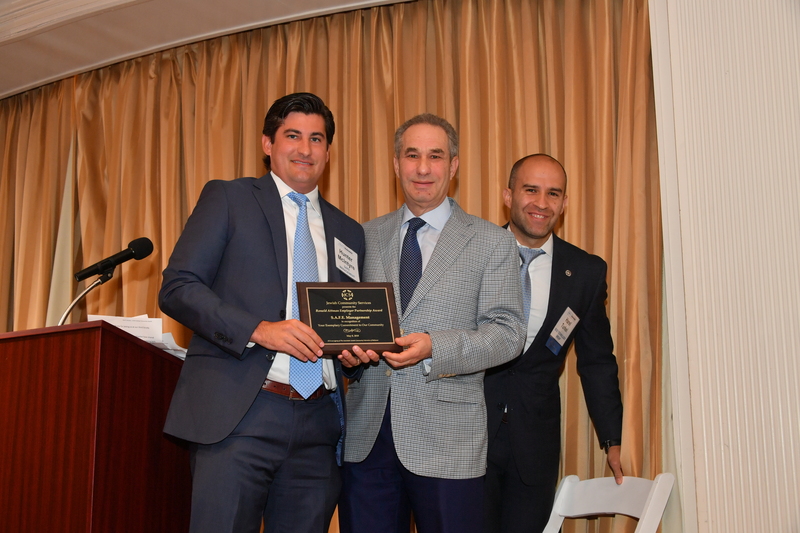 Baltimore, Maryland – S.A.F.E.’s Baltimore Branch Office was honored on the morning of May 8th, 2018 at the Jewish Community Services (JCS) Strictly Business Breakfast. Strictly Business is JCS’ yearly breakfast that honors employers who strengthen the region’s economy through a commitment to workforce development. This year’s keynote speakers were Calvin Butler (CEO of BGE) and Kim Schatzel (President of Towson University) who discussed diversity and inclusion in the workplace. Hunter McIntyre, S.A.F.E.’s Director of Operations for its Baltimore Branch, accepted the Ronald Attman Employer Partnership Award. This award honored the partnership that S.A.F.E. and JCS share in its commitment to find job placement for members of its community who have some form of disability. S.A.F.E. works closely with JCS so that its members can support S.A.F.E.’s efforts at Ravens games, Navy Football games and other events around the Baltimore Region. S.A.F.E. is proud of its role in providing an inclusive work environment and looks forward to growing its partnership with JCS.